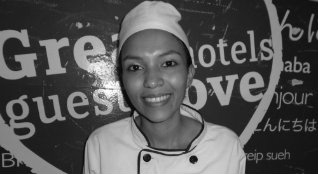 Ignacia Alonzo-Cuisine and Gastronomy - BECA. The BECA.org Foundation. Empowering Youth Education in Nicaragua. Hello friends and family of BECA.org greets Ignacia Carolina Alonzo graduated from the career of Cuisine and gastronomy of the National School of Hospitality (ENAH). I am 20 years old I live in The Las Flores district of the municipality of Masaya. It is a pleasure to compare a little of my history within the foundation. Which starts like this: At the age of 16, I was finishing my fifth year studies at Juana Maria Polanco The region Las Flores, for that time I had no idea what my life would be when I left of secondary school, it was then that we were visited by two coordinators of the organization BECA.org to encourage us to participate in the project REY13, consisted in course one to apply To a scholarship in a technical center. I spent 3 months in community service where I helped teachers with the children and in the afternoons I studied my fifth year so I lasted until the computer course. I successfully concluded them. In the year 2014 I chose my career at the National School of Hospitality, opt for cuisine and gastronomy my first attempt to enter failed and I wanted to give up, in the middle of the year I was operated for. Appendix, it was then when alone at home I saw my cooking programs and they were those means that gave me the most encouragement for wanting to achieve my goals. The following year I presented myself to ENAH with the last opportunity that BECA.org gave me, it was. When God and Mary of Guadalupe granted me the joy and privilege of entering the School, with one of the best qualifications, I attended the first and second level of the Second level my biggest challenge, since I was traveling from Managua to Masaya at 9 pm, Danger many times but was not an obstacle to not continue, I went ahead and in my third Level make my passes in the Real Intercontinental Hotel of Metro Centro, ending in August Of 2016 with good results and positive comments of my development as a chef. I obtained my diploma on July 6, 2016, the week I graduated, I was fortunate to be called by French Chef David Dafonte, executive chef at the Hilton Princess Managua hotel, where I was hired as a cafeteria chef, thanks to Mr. David Dafonte I was able to perform inside his kitchen as a freshman cook. God continues to bless me by giving me the opportunity to to enjoy today in the position of chef of breakfast, and of the hot line, very important areas in the hotel. I thank BECA.org for having come to my life and mainly and above all things to God. For putting them in my way. For almost a year of working at Hilton Princess Managua every day growing more. Thank you beloved BECA family, sponsors, all because this triumph is yours.